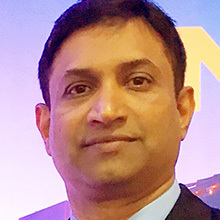 Suresh Palliparambil is senior director of marketing and business development for IoT and security at NXP Semiconductors. He leads NXP’s efforts to expand and grow the secure identification business and payments solution ecosystems, a business that includes NXP’s radio-frequency identification (RFID) and near-field communication (NFC) technologies that can be used to create smart retail solutions ranging from manufacturing and logistics, to retail operations and point-of-sale, to consumer engagement and loyalty programs. Suresh has been working with retail productivity solutions and supply chain management for over 15 years. He holds an MBA from Massachusetts Institute of Technology, an M.S. in industrial management from the University of Central Missouri and a bachelor of engineering from Osmania University.